Trump’s trying to destroy the agencies Nixon helped establish to protect workers and keep air and water clean. 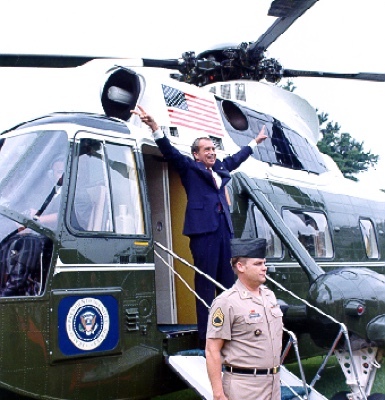 The Presidency of Richard Nixon was a time of great controversy and divisiveness, with the Watergate and related scandals dominating the historical image of the 37th President, and rightfully so. But Richard Nixon also can be seen as the most “progressive” or “liberal” Republican President since Theodore Roosevelt through George W. Bush, and it has been noted that he signed into law many pieces of domestic legislation that are often interpreted as an expansion of Lyndon B. Johnson’s Great Society initiatives. Nixon would never have used the terms “progressive” or ‘liberal” to define himself, but the legislation he chose to sign, rather than veto, had a lasting effect, even more noticed now in 2017 as Donald Trump is following through by executive actions, with the assistance of the Republican Party Congressional leadership, to wipe out the initiatives of a half century ago. Nixon was forced to deal with a solid Democratic majority in both houses of Congress in his years in the Presidency, which had the effect of “tying his hands” to some extent in what he could do, but had he used the veto power, it is highly unlikely that the Democrats and liberal to moderate Republicans in both chambers would have been able to override it. So Nixon deserves credit for recognizing the legitimacy of what was promoted through Congress, an expansion of environmental, labor, and consumer protection initiatives from the Johnson years. While most people would probably not think of Richard Nixon as an environmentalist, he is now seen as one of the top three environmental Presidents by many scholars, behind Theodore Roosevelt and ahead of Jimmy Carter, with Barack Obama rising rapidly in the estimate of experts sifting through the record and accomplishments of his recently ended Presidency. Nixon’s Secretary of the Interior, former Alaska Governor Walter Hickel, originally bitterly opposed when nominated, turned out to be a surprise in his nearly two years as Interior Secretary in 1969-1970, with the establishment of the Environmental Protection Agency, and the declaration of the first Earth Day on April 22, 1970. William Ruckelshaus and Russell Train served as the first administrators of the EPA during the Nixon Administration and had a dramatic impact with their leadership of this so important agency. Additionally, Nixon signed into law the Clean Air Act of 1970; the Marine Mammal Protection Act of 1972, and the Endangered Species Act of 1973. Of greater long range thinking, we also saw the establishment of the National Oceanic And Atmospheric Administration. However, the selection by President Donald Trump of Scott Pruitt as EPA head, and of Ryan Zinke as Secretary of the Interior, along with the consistent effort of the Congressional Republicans to undermine environmental protections and national monuments and parks in 2017, represents a threat to all of the environmental initiatives of Presidents of both parties since Theodore Roosevelt, through Richard Nixon, Jimmy Carter and beyond to include all recent Presidents, including Barack Obama. During the Nixon Presidency, the Occupational Safety and Health Administration was enacted into law at the end of 1970, and fully established in 1971, monitoring labor conditions and setting standards for workers in all areas of the economy. It set up health and safety standards, record keeping requirements, and whistleblower protection. It has made labor conditions much better than what they were before the legislation, and is a subsidiary of the Department of Labor. But with the decline of organized labor during and after the Reagan Presidency, and the concerted effort by the Republican Party to cut regulatory laws, the future of OSHA is in doubt as to its effectiveness, and even its existence. Clearly, Donald Trump, in his drive to cut regulations and government agency effectiveness, is no friend of OSHA. Nixon also signed the law establishing the Consumer Product Safety Commission in 1972, with its purpose being to protect consumers of all kinds of products, particular those aimed at children. The commission protected consumers who’d been ripped off by avaricious corporations and put in place uniform safety standards. Under Obama consumer protection was extended with the establishment of the Consumer Financial Protection Bureau, which was bitterly opposed by Congressional Republicans. President Trump has publicly expressed his hostility to the agency. So we are now living in a time of regression. We have a President who has no clear understanding of the importance of regulatory legislation and agencies to deal with the basic right of all Americans to a decent environment and the blessing of national parks and national monuments; the need of all workers to know they have a safe labor environment; and the protection of all Americans as consumers in all areas of their economic life. Instead we are witnessing the undermining of the progress made a half century ago by a President, Richard Nixon, who despite his great negatives, actually contributed positively to domestic reform.